Scroll to the bottom photo for a look at the New Twist on the leather wrap! The video on this technique is now available. It's easy and looks great--almost like kumihimo! 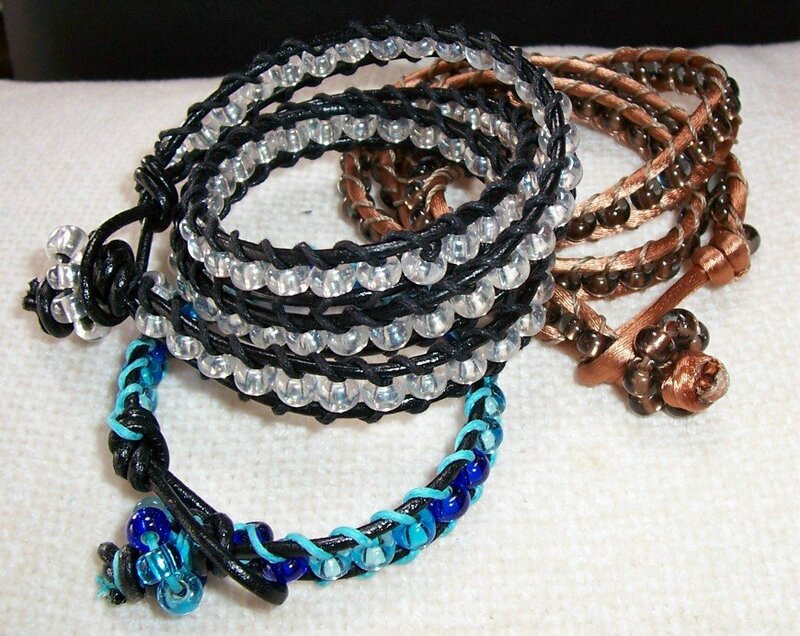 Here are some photos of leather and bead wrap bracelets and necklaces. This is a style that has recently been made popular by the designer Chan Luu. It's a technique that I learned at summer camp years ago and I'm delighted to see it make a resurgence! I offer both illustrated instructions and project kits in the store. Be aware that the kits do NOT include instructions. The reason for this is because most customers order multiple kits and it's useless and wasteful to pack instructions with every kit. These projects are easy to make and are appropriate for children as young as 10. Kits featuring size 6o seed beads are more difficult to make than those with the size 1o and 2o beads. The top photo shows 3 bracelets made using size 1o and 2oCzech seed beads. The Black & White triple wrap and the Aqua single bracelet both feature leather as the stringer and waxed cotton for the weavers, the Camel triple wrap features size 2 (Heavyweight Rattail) as the stringer with #18 S-Lon for the weavers. Note: Size 1o and 2o beads are quite large and lend themselves nicely to this technique. 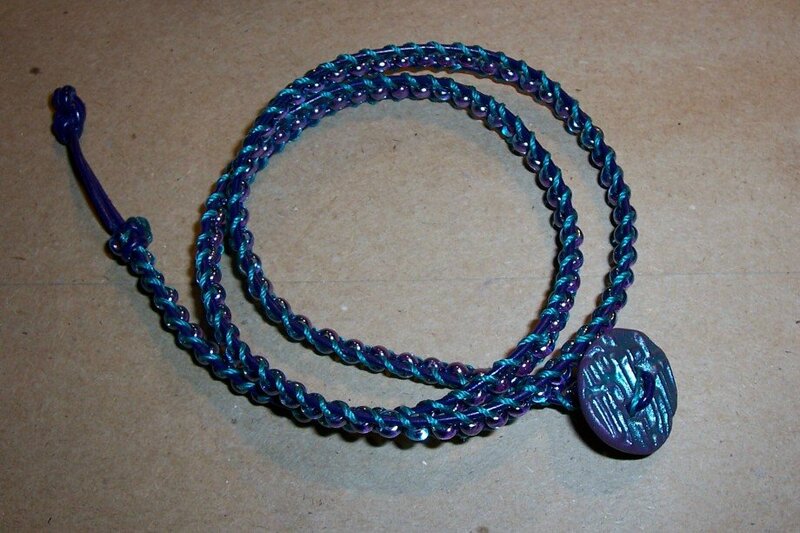 The photo below shows a triple wrap bracelet/double wrap choker featuring a Czech Glass Button for the toggle. 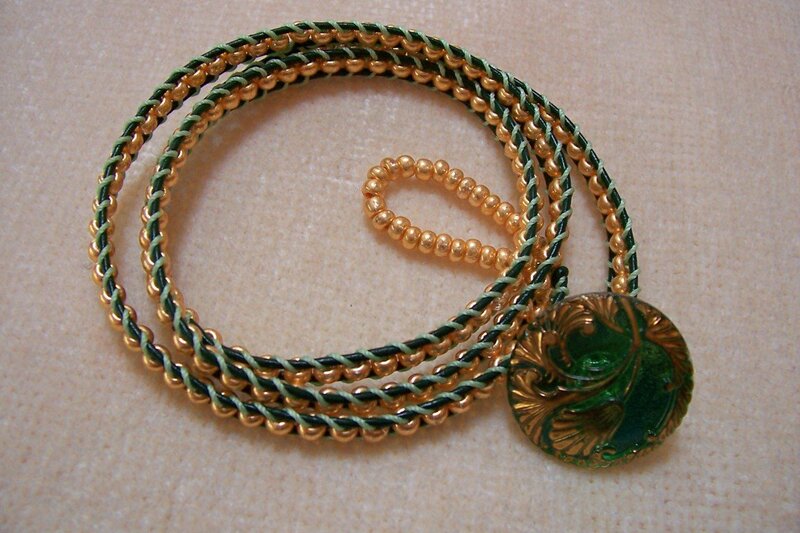 It's made with size 6o seed beads and uses 2mm leather for the stringer and #18 S-lon for the weaver. Playing around with color, the photo below features a simply made polymer clay button, 1mm leather, #18 S-lon and Size 6o two-tone beads. The beads are purple lined aqua so I chose purple leather for the stringers and teal S-lon for the weavers. Still playing around with colors, this necklace takes it's cue from the Czech glass button used for the toggle. The button has a lime green ground with a bright yellow over-all. The dragonfly is then done in 2 shades of blue. 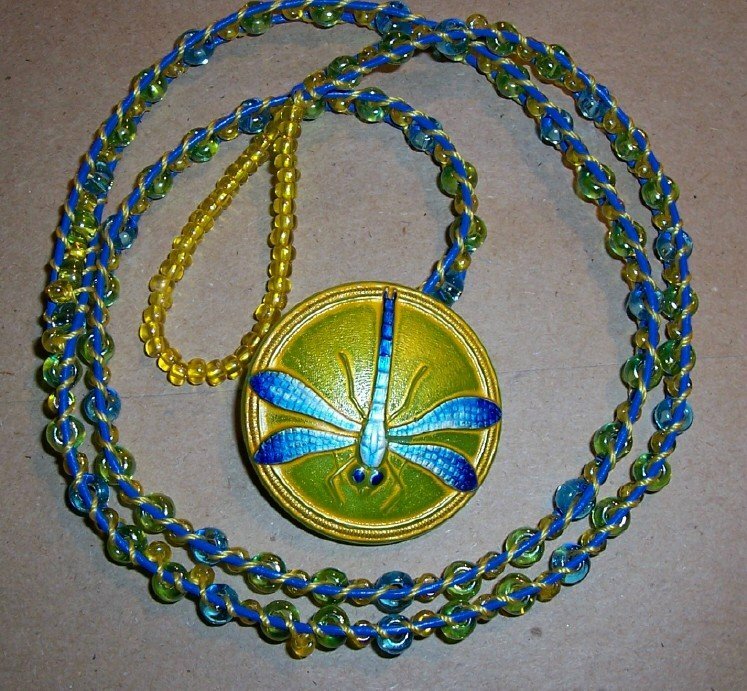 The beads in this project are mixed sizes (slightly more difficult to make) with the yellow beads at size 6o and the green and blue beads at size 2o. The stringers are 1mm blue leather and the weavers are yellow #18 S-Lon. 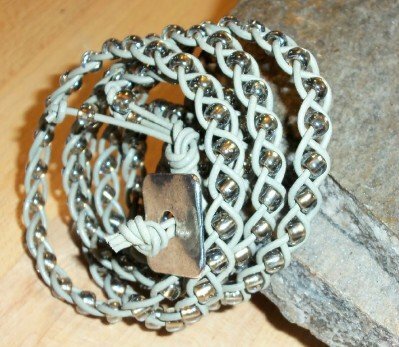 Here's the New Twist on the Leather Wrap Bracelet! It's made with 1.5mm leather in taupe and the size 3/o Toho seed bead in gold lined black diamond. The toggle bead is listed under the imaginative category of "Toggle Bead" for ease of ordering! This was the first of the New Twist bracelets I made. 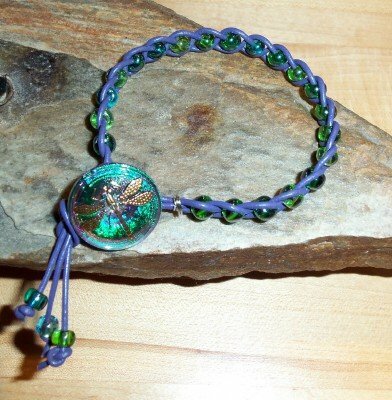 It's using the 1.5mm leather in lavander and the size 2/o Czech seed beads in the green luster mix. The button is Czech glass and they are now in the store!